Let’s catch up on the week’s news in MLW. Teddy Hart is on the injured list with a storyline concussion, the Dynasty has been fined for champagne chicanery, MLW closed a deal to bring Fusion to the UK, and LA Park will have an open challenge on the latest episode of Fusion. First off, if you haven’t yet seen the Battle Riot II show, go check it out on YouTube and read the recap and review. You’ll probably be making the same silly expression as Mance Warner while watching. Go now, because discussion with results is ahead. Fresh off two sell-outs in NYC, MLW announced they will be returning July 25 to the Melrose Ballroom. Tickets go on sale April 15. MLW’s next events are June 1 in Milwaukee and July 6 in Chicago. The Dynasty was fined for smashing a champagne bottle over the head of Teddy Hart. MJF, Richard Holliday, and Alexander Hammerstone will each have to pay $1,500. That is bogus for Holliday and Hammerstone. They didn’t do anything. It was MJF who sent Hart to the hospital. 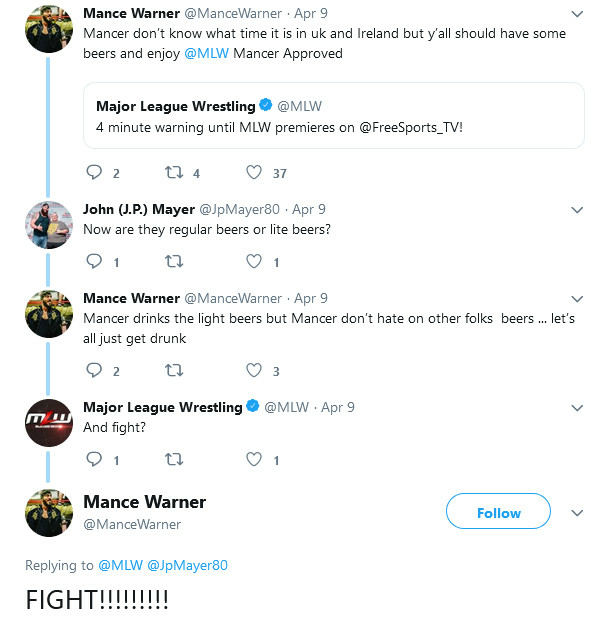 It wouldn’t surprise me if MLW used that money to pay for Mance Warner’s light beer budget. As mentioned on the broadcast, Teddy Hart was sent to the hospital due to concussion symptoms. MLW’s medical team ruled that Hart will be out at least two weeks. When Hart returns, he wants a match against the perpetrators. That must be the story set up for the tables match between the Hart Foundation and the Dynasty at Rise of the Renegades. Even though LA Park has a heavyweight championship shot in his pocket by winning Battle Riot II, MLW was still curious who the fans wanted to see wrestle Tom Lawlor. Davey Boy Smith Jr. is a surprising winner, in my opinion. Heck yeah, I want to see that match, but I figured he would be third or fourth. Smith may be gaining a fan base more sizeable than I suspected. Good for him. Davey Boy deserves it. UK! Ireland! 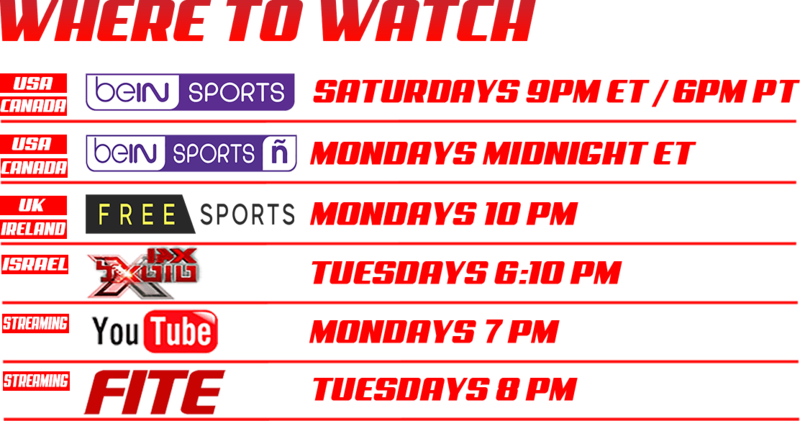 MLW premieres tonight at 10pm on @FreeSports_TV with… THE 2019 BATTLE RIOT! FreeSports is available for free in 18 million UK homes. To put that number in perspective, there are roughly 67 million people in the UK. To our Cagesiders across the ocean, what is your opinion of FreeSports? As a reminder for the rest of us, MLW can be seen in a variety of ways. YouTube has been the easiest for my viewing pleasure, but the future of MLW on YouTube may be changing. Twitch doesn’t sound like an alternative to replace YouTube. It will be interesting to see where MLW goes next in the digital world. The latest episode of MLW Fusion looks to be a solid outing. If you missed it Saturday night on beIN SPORTS, don’t fret. MLW will have you covered on YouTube at 7 pm ET for Monday. A confident Salina de la Renta has offered the opportunity of an open challenge against LA Park. I’m hoping for someone hefty. Ace Romero would be cool. Brian Pillman Jr. will be looking for revenge on behalf of Teddy Hart as he wrestles MJF. It will be interesting to see if Pillman keeps it clean or goes hog-wild in an attempt to dirty MJF’s pale body with bruises. Rich Swann and Myron Reed will be teaming up for the first time to take on Jimmy Yuta and Lance Anoa’i. There will also be segments with the Contra Unit and Mance Warner. Not together, I don’t think, but I’d be very curious to see what would happen if the Contra Unit did destroy Warner’s light beers. Who would you like to see fight LA Park? Will Brian Pillman Jr. fall victim to the numbers game while Teddy Hart is on the injured list? How many referees will get beaten up on MLW Fusion? We’ll close with this funny exchange from Mance Warner about beer and fighting. Time to walk to the market for some light beers. Who’s with me? Rumor Roundup: Women’s tag team titles, Jason Jordan, SmackDown on FOX, more!